Tidying Up with Marie Kondo very politely asked if we really needed all those books in our house and the internet lost its damn mind. For a country that prides itself on its staunch individualism, Americans sure do love being told what to do. Or, at least, they like watching shows where experts tell other people what they should be doing. These shows range from loving and lovely (every single Queer Eye episode has made me cry) to downright destructive (contestants from The Biggest Loser cry, are yelled at, and suffer only to eventually gain back the weight and have their metabolisms permanently slowed in the long run). So it was no big mystery to me why Tidying Up with Marie Kondo became a viral phenomenon. Here was a show that taught you how to tidy up your space in the kindest way possible — no sharp teasing or prescriptive advice like most American shows. In fact, the method all centered around a simple question: Does it bring you joy? And for a few days, we all basked in that joy. I saw photo after photo of neatly folded clothes and organized closets, people saying goodbye to old toys, gifts and clothes that no longer brought them joy. Everywhere I looked, people were joyfully giving away that which they no longer needed. I should’ve known it wouldn’t last. Before I continue, let me be clear on my stance regarding books: I love them. A lot. Every year in elementary school, I won the school-wide competition for the most books read in a quarter. In high school, the only time I ever got in trouble would be when I was reading when I wasn’t supposed to. I majored in English in college, then switched to English Education my last two years. I teach middle school English, and, when I had more time, I used to review books for Hypable. So my love for books is deep, real, and abiding. So why — with this deep, ardent love of books — aren’t I incensed that Marie Kondo has demanded that I only retain 30 books in my household? Well, simply because she never actually said that. In fact, I’m starting to think that while Marie Kondo’s critics might love books — the physical, tangible object — they seem to have trouble with even the most basic of reading comprehension skills. They certainly seem to lack basic critical thinking skills. 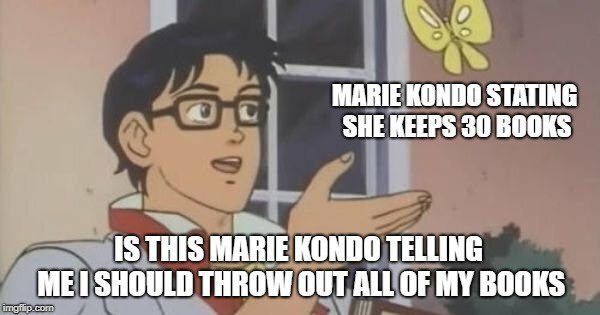 It’s the only explanation I can come up with for why so many people are so angry at Marie Kondo. Well, no — it’s not the only explanation I can come up with for the surprising ire against Marie Kondo. The second reason people have taken Marie Kondo’s tidying advice in a way that seems strangely personal has nothing to do with their low reading comprehension skills. But it does have everything to do with their xenophobia. Let’s tackle the first bit of criticism that has book lovers angrily clutching at their books — the so-called 30 book rule. The first — and really only — thing to know about this rule is that it doesn’t exist. Marie Kondo’s stance on books is actually pretty similar to Michael Pollan’s stance on food. But where Michael Pollan’s advice was met with praise, Marie Kondo’s has been met with a loud, angry and weirdly personal cry of outrage. So where, then, does this 30 books rule even come from? 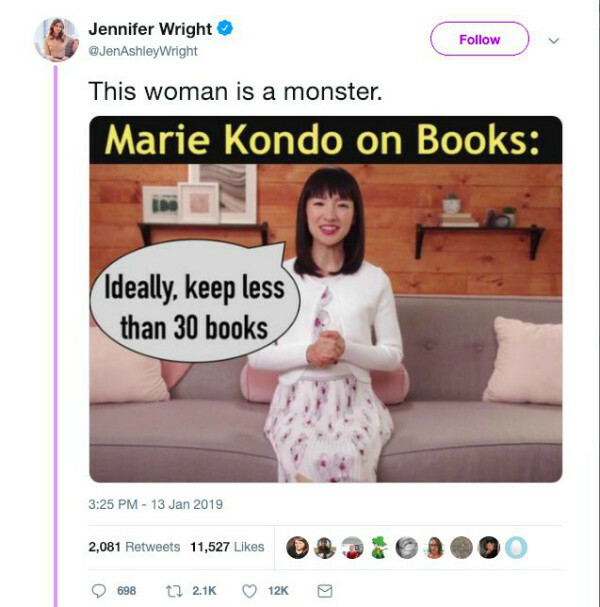 Well, the number 30 comes from the fact that Marie Kondo herself says that her personal collection of books is 30 volumes. She never goes on to mandate that you need to be like her, or that 30 is some magical number that will bring you a longer life and greater happiness — all she says is that 30 is her number. It does not need to be your number. And as for the concept of sparking joy? Well, again, that’s where basic reading comprehension skills come in. It should be obvious to nearly anyone that the idea of an object sparking joy is not the same as an object itself being joyful. I suppose this is, in a way, an issue with translation — a better way to translate Marie Kondo’s concept is to hold an object and see if it stirs something in your heart. But really, if you really made a good faith effort to sit and watch Marie Kondo’s show or read her book, you’d immediately understand that she is not equating a book filled with joy to a book that sparks joy. So if your floor to ceiling wall of books brings you joy, keep them all! Keep the books you only bought because you felt like you were supposed to have read them, the books that exes with bad taste gave you, the books you have multiple copies of. If they truly bring you joy, keep them. It’s exactly what Marie Kondo would want. The thing is, I wasn’t even particularly a fan of Marie Kondo before all of this backlash started. I’d never read her book and I watched one episode of her show, enjoyed the principles, then decided I didn’t need to watch an entire season to learn how to implement them and never started the second episode. But I get suspicious when I see a lot of white people outraged over something a person of color has done or said. And because I’m a creature of salt and spite and suspicion, I decided to go back and watch all of Tidying Up with Marie Kondo and then went ahead and bought her book. And here’s what I found: Marie Kondo is one of the gentlest, sweetest lifestyle guides I’ve ever come across. In fact, what struck me most about both the show and the book is that other than the ‘rule’ of holding everything and seeing if they bring you joy, Marie Kondo offers very little prescriptive advice. She talks about what works for her — fully embracing that it might not work for you, specifically — and gives suggestions and asks good questions, but she is very gentle and kind and lacking any kind of judgmental tone or attitude that I’m so used to seeing from her American counterparts. In both her show and in her book, she outlines what has and hasn’t worked for her, gives suggestions on what may work for you and is exceptionally flexible with people so that together they can find the right amount of stuff that brings them joy. And for this, she’s been called a monster, been compared to both real and fictional dictators, had her words obfuscated, taken out of context or made up altogether to demonize her. It’s all so very frustrating to me. FYI: that guardian thinkpiece on Marie Kondo which – again – completely misunderstands the KonMari method, and thinks that it means only keep happy books, is also racist. The writer calls Marie's practice of waking books up – part of Shinto animism – "woo-woo fairytale nonsense." Because it’s not like the idea of tidying up is new. This is a country where minimalism and its principles have been a fad for decades. Where (mainly white, upper class) lifestyle bloggers tell you how to create a capsule wardrobe and espouse the tenants of Swedish minimalism. Where we’ve had shows like Clean Sweep, where a team of experts bully you into de-cluttering; Clean House, where people bully you into having a garage sale; What Not To Wear, where two fashion experts surprise you, throw out your clothes and make buy you new ones. Not to mention about half a dozen or so makeover shows which are intent on telling you what’s wrong with you, your home, and/or your lifestyle and mandate that you become better. Marie Kondo does not barge in, uninterrupted, into people’s homes to tell them how to live their lives. She does not demand that you cut all your belongings in half indiscriminately, nor does she employ sarcasm, guilt, shame or even sharp teasing to get you to let go of your stuff. She offers no prescriptive advice at all, really, apart from asking that you think about which of your belongings spark joy. Yet these shows — headed up by mainly white westerners — have come and gone without even half the discourse and outrage I’ve seen levied against Marie Kondo’s decidedly gentle approach for tidying your house. The full thread can be found here and is totally worth your time to read. Marie Kondo introduces herself to your house. She thanks what you consider to be lifeless objects. Since English is her second language, she uses an interpreter as she helps you tidy up your house. In short: Marie Kondo does not look or act like the lifestyle guides Americans are used to. Which is why the heightened ire towards her truly innocuous, truly non-confrontational advice for how to clean up one’s house smacks so loudly of xenophobia. Marie Kondo’s method of tidying up is heavily informed by her own cultural and religious experiences and beliefs. They are, it should go without saying, different from many American experiences and beliefs. Which is why a concept as simple as asking what’s worth keeping all of a sudden is perceived as a direct and personal attack. 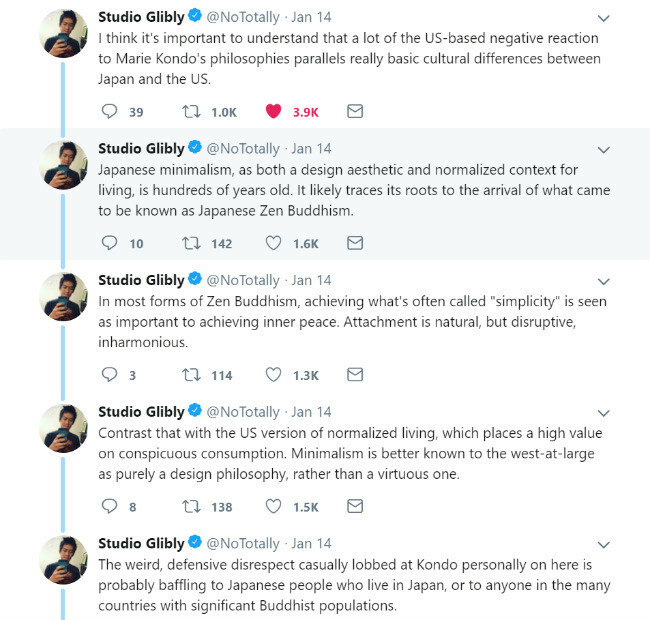 The loudest of Marie Kondo’s critics seem to perceive these differences in cultural values as an attack on their own personal values — an attack on their very sense of self. It isn’t, of course. 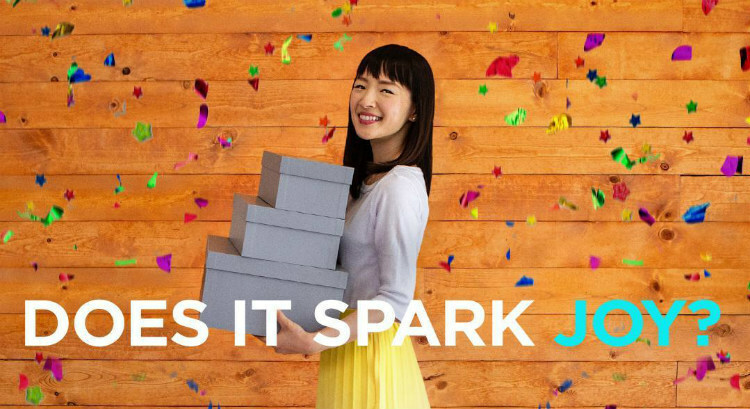 Marie Kondo isn’t interested in re-writing anyone’s personal values. She just wants people to be joyful in their own home. There’s a real worrying and infuriating underlying current beneath the self-proclaimed love of books, one that seems to say, how dare this woman — who needs an interpreter, who practices woo-woo nonsense — tell us how we’re meant to live. How dare she have the audacity . Because I have to think that were it anyone else — were it some blond, white, western woman with a soothing voice, or a well-groomed, muscular white man with a twinkle in his eye — people who didn’t agree would say, well, this isn’t for me. And then move on. But that’s not what’s happened with Marie Kondo. If anything, the outrage has only grown as more and more people have found more ways to completely and sometimes deliberately misinterpret her words. I’m not saying that the KonMari method is beyond reproach or that her system of tidying up is unassailable. I’ve seen plenty of thoughtful pieces that discuss her system as a whole and put it in the context of people for whom tidying up is linked to trauma, or for whom the accumulation of things takes on a different meaning when it comes to those who have lived in poverty, or individuals from certain religious and ethnic minorities. I am not discounting the validity of those critiques. But I’ve also not seen any of those critiques blithely label Marie Kondo to a monster for words that she didn’t say, or compare her to Mussolini or President Snow for concepts that she in no way mandates you to follow. At the very least, these critiques seem to have read her book and used basic comprehension skills while doing so. I’m not saying all her critics should read her book. It wouldn’t bring them joy to do so, and that’s the last thing Marie Kondo would want. What I would like is for them to stop criticizing her methods as if they have read her book, though. That’d be a great first step. I’d like them to be able to step back and say, this might not be for me, and then move on. And, really, what I’d like most is for them to take hold of all their feelings of anger and spite and bitterness towards Marie Kondo, hold it up towards the light, and ask themselves: Why does criticizing Marie Kondo bring me so much joy?